Like many young couples, Tara Mooney and Joseph Thelin eagerly awaited the birth of their first child. Their spirits soared at the site of their baby’s first picture, an ultrasound print. Their hearts skipped a beat when they first heard their daughter’s heartbeat in the doctor’s office. And like most couples, they were overjoyed when they felt their baby kick. The pregnancy was normal in every way until March 17, 2008 - the day before Katherine Rose Thelin was born. Tara and Joe channeled their grief into doing good works for children in memory of their stillborn daughter. In their search for the perfect service project, they heard about an unmet need close to home. They learned that for decades, a playground had been in the master plan for Royal Lake Park, but a lack of funding prevented it from becoming a reality. So they launched a grassroots fundraising campaign that ultimately led to Katie’s Playground at Royal Lake Park. 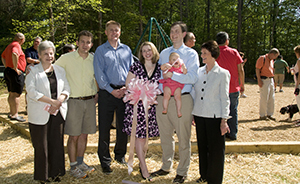 “Our heart was really set on the idea of creating a special place just to celebrate Katie’s memory and a playground where children could meet, gather and play,” Tara said. Tara and Joe’s second child, Mia Grace Thelin, was born 17 months after Katie. 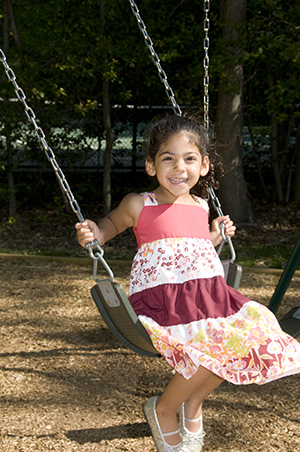 Her parents say she is a “joy and a blessing,” and they find comfort in sharing her sister’s legacy with Mia and all the other children who often visit Katie’s Playground.